Here's a quick note to let you know that I'll be making the trek up to Jacksonville, FL this weekend to play at a new night called Oui Disco. Thus, this Saturday May 9 I'll be lugging my record bag (filled with magic platters) to Café 331, located at 331 W. Forsyth Street (click HERE for map). 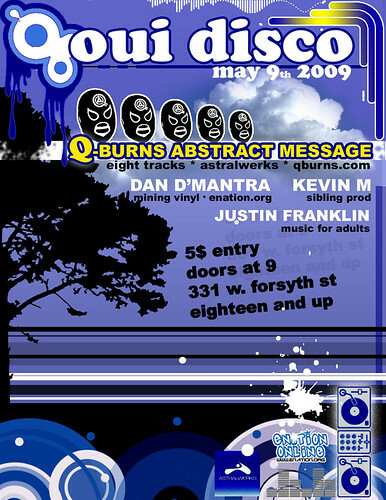 Also part of the line-up will be Dan D'Mantra, Kevin M, and Justin Franklin. It's a night of house music and future funk. The doors at at 9 PM, it's 18 and up, and the cover is a mere $5.00. I hope to see you there for Oui Disco!